A gorgeous garnet stone makes a solid display of vintage style in this Apples of Gold ring. 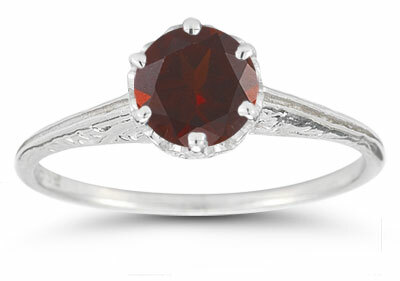 The perfectly placed 14K white gold prongs keep the round cut garnet gemstone securely in place. The luscious red color of the gem is contrasted by the sleek radiance of the white gold. An ornate mounting keeps the scarlet stone looking lovely over the band, while simple but delicate engravings adorn the white gold foundation, making this vintage ring one to remember. Also available in Sterling Silver (shown below). We guarantee our Vintage Prong-Set Garnet Ring in 14K White Gold to be high quality, authentic jewelry, as described above.